This is the third album to be released by singer/songwriter John Waller. 'As For Me And My House' is an eleven track collection of songs that John has written since his previous successful albums. You might know John already, as he had a massive Christian Radio hit single with the track 'While I'm Waiting', taken from the 2009 album of the same name, due to the song featuring in the movie Fireproof. His first release was back in 2007 with the album 'The Blessing'. 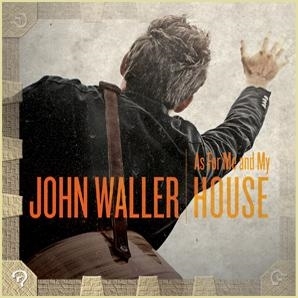 Read More This is the third album to be released by singer/songwriter John Waller. 'As For Me And My House' is an eleven track collection of songs that John has written since his previous successful albums. John Waller is a very talented singer, and that is what grabs you first when you put his latest album on and soft soulful vocals invade the room. John is one top quality singer, well worth exploring if you like rich vocalists. As For Me And My House is a very middle of the road tempo style of album, that isn't a negative comment, as a lot of people like Christian music like this. Just don't expect big power guitars like on the albums by bands like Anthem Lights or The Afters, try to think more in terms of James Blunt and Matt Kearney and I think you might be on the right track. Lyrically the songs on this album are direct words from the Bible, which is great as the Bible is full of truths and amazing words from God. This can also at the same time feel like John is saying a lot of words that have already been said before, similar lyrics to songs from say ten years ago, but the lyrics are still strong things that need to be said. Add this with soft rock modern music and then you will grasp the style of John Waller. One song worth mentioning is the amazing The Marriage Prayer, a joint male and female vocal, about the importance of praying for your marriage, your partner and the daily life struggles and blessings that come from marriage. Interesting song, and not a topic that is talked about or sang about much, but a very important topic. Overall a solid third album from John, some really interesting moments, with bible based lyrics throughout, this album will leave you with a strong sense of God's word on top of the firm music.